I don’t need to tell you: selling just doesn’t work like it used to! It used to be a salesperson held all the cards – had all the information a buyer needed, and the consequent power over any deals on pricing, spec, etc. But today, information is highly accessible to anyone who cares to search for it, and the buyer holds the upper hand. A successful salesperson today needs to adapt to this new paradigm – to be cognisant of the contextual relevance of a customer's enquiry, focusing more on achieving trusted adviser status, and being helpful, transparent, open on pricing. And, to do this well they need to leverage technologies that help them collate the vast amount of available information. This has been evidenced in part by the rise of increasingly sophisticated CRM solutions. But, for many, the actual experience of working with these systems is somewhat burdensome, the main beneficiary the person running the sales team. In short, CRMs can require a lot of data input from the sales person and, as well as taking a lot of time, it also turns them into data entry people too - so not such effective salespeople. Enter inbound marketing experts, HubSpot, who today announced the launch of their new CRM tool, built specifically around the way people buy today. 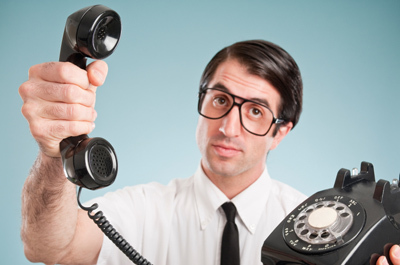 "Traditional sales technology is necessary but not sufficient. HubSpot's Sales Platform is designed to arm sales teams with the context they need to improve how they engage with companies, prospects, and leads to drive sales instead of driving people crazy." Your sales teams will directly feel that benefit, with a sales platform that allows them to engage with prospects based on up-to-date, personal and pertinent data, so that they can perfectly tailor their approach. What’s more, it is designed to save your team time instead of giving them more to do. There when they need it, and out of the way when they don’t. And, it works precisely to your sales process, with customisable fields and views that map how your company manages deals through the sales funnel. 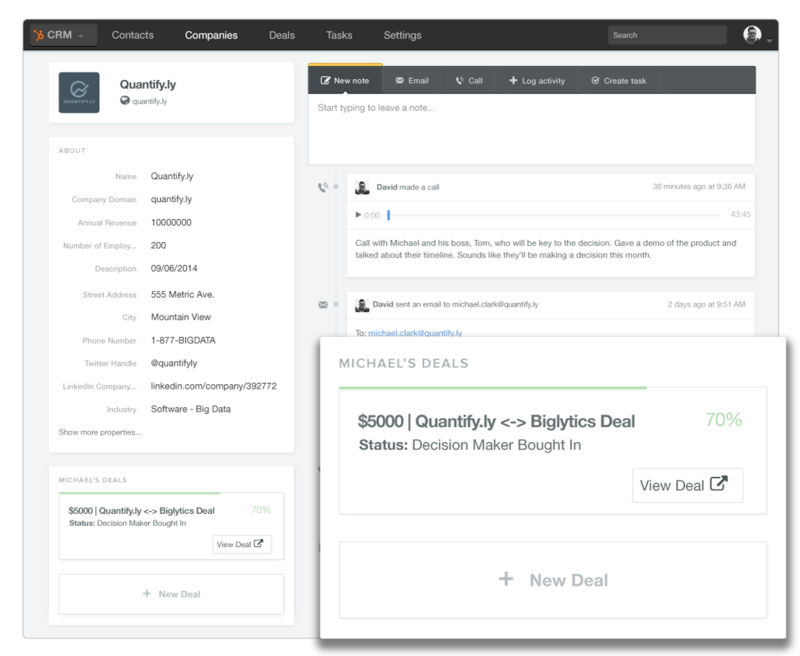 The new CRM features a timeline for each contact capturing all touch points in one simple view giving the salesperson deep insight into the level of engagement and activity for each prospect. You can automatically create company records, associate contacts, de-duplicate leads, log deals and tasks, liberating your sales team from many of the onerous chores they shouldn’t need to be distracted by. 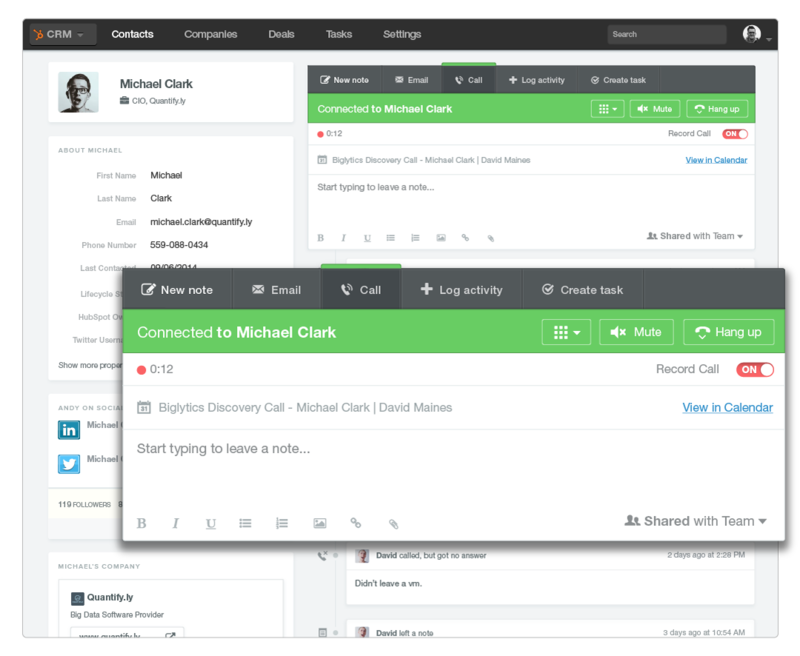 The CRM connects to Gmail, Google Apps, Outlook, and Apple Mail, logging emails with your contacts easily and automatically and you can send emails right from any contact’s record. With one click you can call a contact – using VOIP – directly from the new HubSpot CRM; it will make a recording of that conversation (optional feature/incurs additional cost) potentially freeing up your sales people from hours of data entry. Calendar Integration – You can easily integrate Google Calendar with the HubSpot CRM, allowing you to see scheduled meetings and create new appointments in seconds, without ever leaving your CRM. Data Enrichment - You can instantly see new, useful information about any contact or company, including background information, details on key personnel, social data, related companies, and more. Sidekick Notifications provide real-time alerts of when, where, and how your prospects are engaging with you - opening or clicking your emails, visiting your web pages etc. One amazing thing about these new tools is they are integrated into the HubSpot tool at no extra cost. In fact, in 2015 the CRM will become available to all, irrespective of whether or not they are HubSpot customers. But with the extraordinary segmentation, contextualisation and insight available through the marketing platform, integration between HubSpot Marketing, CRM and Sidekick is going to give any organisation a seriously ‘unfair advantage’ over their competition.